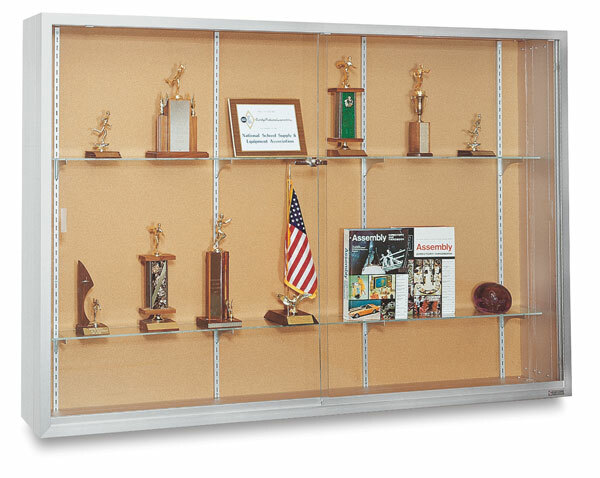 Claridge Sliding Door Display Cases are wall-mounted cases, handsomely designed, built to provide ample protection for exhibits. Each case is built of extruded aluminum with an etched and anodized satin finish. Doors slide easily over nylon rollers, and are fitted with flat key tumbler locks. Glass shelves are adjustable. Back panels are available in Natural Tan Cork, or in colored Fabricork in a variety of colors.